The attack too place at the Central Bar on Cross Street, Killyleagh, as the parade passed through the town on Saturday night. One customer was treated in hospital after receiving a head injury. The owner said that bandsmen returning from a feeder parade stopped outside the pub to play ‘The Sash’ before loyalists came into the pub. Windows were also smashed in an adjoining off-licence and at his home nearby. Mr Polland said he believes his recent support for a GAA club in the mainly unionist town was the reason his pub was targeted. “They started to throw chairs and glasses around the place. “There were 10 customers in the bar at the time and five of them were women. 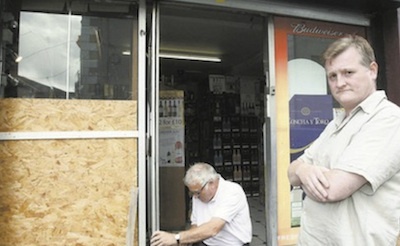 “They came around the side and broke the windows in the off-licence. After that they went to my house and smashed a window there. That makes it personal and that’s what annoys me. Mr Polland said he believes his recent support for a GAA sports club in the mainly unionist town may have been the reason he was singled out for attack. One local unionist councillor William Walker, a member of the Killyleagh Apprentice Boys who took part in the parade, said pub-goers standing outside the pub had been “making remarks”, and this had started the violence. He claimed they had come out of the bar “to provoke” -- and should have stayed in the pub until the parade passed. Sinn Féin MLA Chris Hazzard described the DUP man’s comments as “disgraceful”. “I can tell Councillor Walker that the days of ‘croppies lying down’ are over and gone for good and that nationalists have a right to go about their normal life without fear of intimidation,” he said.